Singleplayer Final Fantasy games needed a shot in the arm. What's cool about seeing my PC Gamer colleagues pick up Final Fantasy 15 now is how they talk about the things I loved about the game 15 months ago, when I first played it on console. That is, the damn tasty-looking food that always makes my stomach roar with hunger, which Tyler wrote about yesterday, and the in-game photography feature, which provides you with snapshots of the characters' journey that they'll comment on at the end of each day. Both are elements that were new to Final Fantasy with the fifteenth entry—but they got people talking about the game more than anything else, by being laser-targeted at players who love to share screenshots online. Both features speak to the game's earnest and goofy charm. Final Fantasy 15 is not the best RPG in the series—not in any traditional sense, when it comes to combat, progression, and that sort of thing. But the actual journey through its world is among the series' most enjoyable. It dials in on that specific feeling of travelling with a party in an RPG and makes that the entire game. In older FFs, you mostly walked silently through gorgeous surroundings with your party off-screen, and the sense of journey would be conveyed through cutscenes and occasional in-battle dialogue. Here, all four members of your party are on-screen at all times, and they constantly interact with each other—it makes a hell of an impact. "There were three key words we had on the board when we started out development of the game: comrades, car, journey," FF15's game development manager Kenichi Shida told me in London a few weeks ago. It shows. 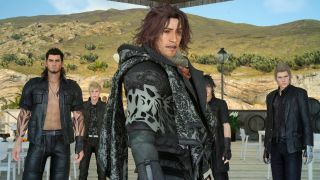 I couldn't tell you much about the main story of Final Fantasy 15—the kingdom of Lucis falls, Noctis is getting married to someone you see about four times in the whole game, a seemingly immortal guy called Ardyn is the villain—but that's because the game is bad at traditional RPG save-the-world stuff. Anything that isn't about the four main characters is incoherent and rarely that interesting. I don't think Final Fantasy necessarily needed saving (FF14's loyal playerbase can attest to that), but Square Enix did need to figure out what a modern version of a singleplayer FF looked like. A friend of mine teaches English to young children in Tokyo. Over lunch at Christmas, he told me that his students love Nintendo's Splatoon and various mobile games, but regard Final Fantasy as their 'parents' game'. This was just anecdotal, and I'm not saying it's evidence of anything, obviously, but it did remind me of something that FF15 director Hajime Tabata said to Game Informer back in 2016. "The gravest situation of all was that, at the time we were starting Final Fantasy 15, we didn't see an increase in new fans of the franchise." When I grew up, Final Fantasy was still in what I would loosely term a golden age, which began during the '90s and arguably ended with Final Fantasy 12 in 2006. If you're 15 now, which is the age I was during my peak interest in the series, singleplayer Final Fantasy has never been world class in the time you've been playing games. I get the caution that led to FF15 being an action RPG set in an open world: it's not impossible for entire genres to fall out of favour. Final Fantasy XV brings the series into the era of games like The Witcher 3 and Skyrim, but with a tone that's still in line with the series' best entries. It feels modern, and Square Enix hasn't achieved that since FF12, even if I don't totally buy the narrative that the FF13 trilogy was a giant misstep (it still brought great combat systems and interesting experiments with structure). What it lost in the transition was depth. Final Fantasy 15 is pretty simple by the series' standards. It's structured in a way that'll feel familiar to anyone who's played an open world game, but for a series that has an impressive history of complex progression systems that are easy to grasp, this game does not have that. There's the Ascension Grid, which offers a progression path, but it's so simple compared to the Sphere Grid in Final Fantasy 10 or junctioning magic in Final Fantasy VIII. One of 15's post-game battles is with Adamantoise, a mountain that turns into a giant angry tortoise, and beating that on PS4 was simply a matter of spamming buttons and repeated use of buffs. You have a few options to use your party's abilities in combat, but there aren't loads of enemies that can't just be defeated by hitting them repeatedly. The flipside is, the spectacle of battles is often extraordinary, helped by lavish animations, often gigantic enemies and excellent battle themes, which the series has always been good at. Even though I find arguments about what counts as an RPG deeply tedious, I don't think Final Fantasy needed to jettison as much as it did to stand up as a modern open world game. Not that I found it particularly hard to find reasons to stay in that world—I played 114 hours on PS4, and if a mod scene takes off on PC, I'll play many more hours on top of that. But in-depth combat and progression systems are as much a part of the series' DNA as spiky-haired teenagers, cactuars and chocobos. Perhaps future entries will develop that side of things more, but I can't see the series prioritising turn-based combat again after FFXV sold 6.6 million copies. Non-linear games seem to represent the future of singleplayer for major publishers. Final Fantasy 15 excels in other areas, however. That journey, unfinished as it feels in its second half, as you only get snapshots of a world you can't fully explore, succeeds in conveying a real sense of journey for these four characters. This friendship is presented so earnestly, with none of the cynicism or wariness that you expect from modern media, and that makes it easy to celebrate even when it falls short as a traditional RPG.